The Outdoor Discovery School offers 3rd and 4th grade (and above) boys and girls a unique learning experience in the outdoors. 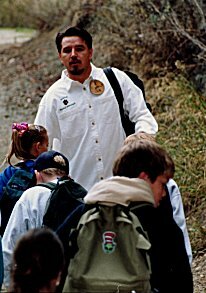 As a class, students travel to Trask Scout Reservation located in the foothills above Monrovia, California. Almost immediately the wilderness becomes a classroom with mountain trails for hallways. On our 400 acres, students discover evidence of wildlife, local flora and the beauties of a chaparral environment. This hands-on program allows each child to discover the wonders of the outdoors for themselves. During their visit students may follow along a beautiful watershed trail that ends where a natural waterfall has formed, or perhaps visit the Gabrielino Indian Ceremony Site. To complement their outdoor experience, children will enjoy indoor live plant and wildlife displays, rock and soil samples, fossils and dinosaur bones, a hands-on laboratory, audio-visual selections, a nature-art area, and a resource library. By combining outdoor based curriculum with enhanced indoor experiences in the Nature Center the students will leave with a better understanding of earth's natural systems and a deeper respect and appreciation for their environment.